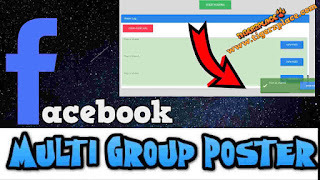 Hi there Tigerz, in this post you will learn How to post in multiple Facebook groups at once with Facebook Auto Poster 2019. I'am gonna share Best Free Facebook Auto Poster with you guys which can post in Facebook all groups automatically. 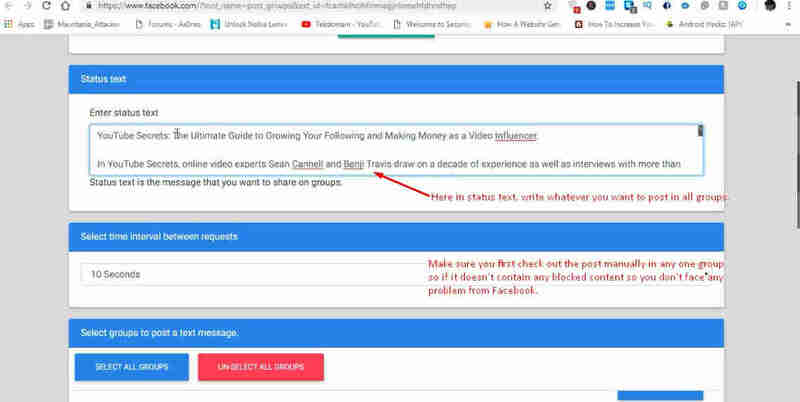 Its pretty much will help you to Auto Post In All Facebook Groups at once. It's safe and working 100%. I already have tested the multiposter and published video on it on YouTube. ( Auto post to facebook groups at once - [Facebook Auto Poster 2019] ). I have published many other videos on such facebook auto poster and facebook multi group poster. Some of it still works but need to some extra techy steps like providing token access and adding user account first in the facebook group poster after which you will be able to setup the poster for further Facebook auto multi posting. Which is hard for many users and some of the sources are dead and can't be used for Facbeook auto group posting anymore. But no worry I'm here with another safe and almost like a permanent source of Facebook multiposter for groups. 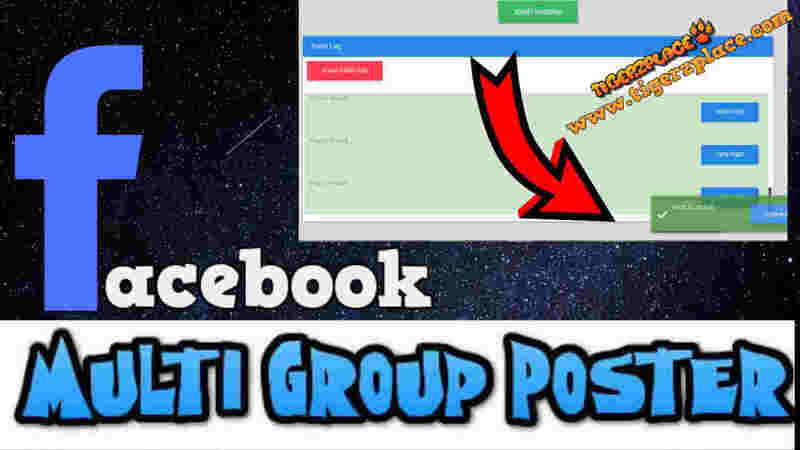 Using this facebook auto poster you can post in all Facebook groups at once automatically, additionally you can skip some of the groups if you don't want to post in those groups and also can schedule post withing this Facebook Auto Poster extra feature (Facebook Schedule Poster). It is free and best tool to get traffic from Facebook by posting in all Facebook groups all at once with 1 click. For this I'll be using an extension which contains many script but I'll just use the Facebook auto poster script which will help us to post in multiple facebook groups at once without any further access token providing or setting up account. First thing first you will need the extension which include Facebook Auto Poster using which we will be able to post in multiple groups at once. The extension is Facebook Social Toolkit ( toolkit for facebook). This extension is not totally free as it also contain some premium tools as well. But no worry we only just need Facebook Auto Poster which is free to use. If you want to get premium version of the toolkit, so you will need License Key For Facebook Social Toolkit. I do have some post for it you can check it out here: Facebook Social Toolkit سيريال where I shared Facebook Social Toolkit License Key For Free ( But note that its the old version of the toolkit which was published months ago, still works but it doesn't contain the group poster). I am just sharing it if in case you need to use other premium tools in the toolkit. Anyway back to our own Facebook Auto Poster tutorial how you can use to post to facebook groups automatically. As I told you that you will first need the extension so let's grab the extension and will then further deal with the method. You can simply just search in GOOGLE for `Toolkit For Facebook` or just access the extension page using any of the following links I have provided below. Once you added the extension in your browser (Chrome Brower) then just open the toolkit from the icon on top right corner (which says TFF). 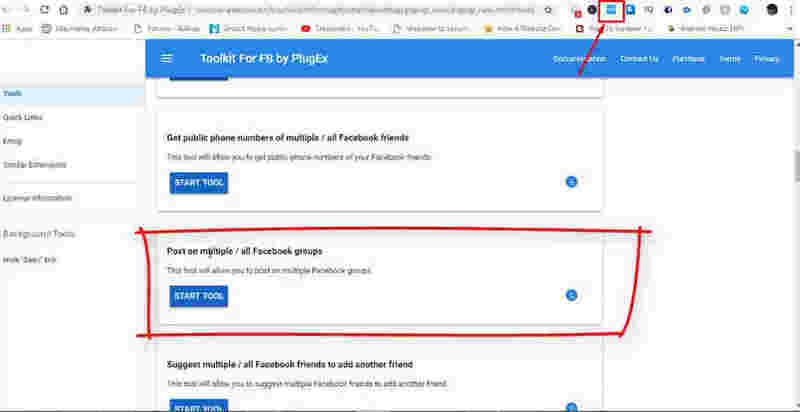 As soon as you click the toolkit it will open another tab containing many tools which include free and premium scripts within Facebook Social Toolkit. In those tools you have to search for "Post on multiple / all Facebook groups". Just click on and it will open the tool in another tab using your account. Make sure you are logged in with the facebook acoount from which you want to post in all facebook groups automatically. Now once you are ready with all the rest settings and you have got the multigroup poster tab. You are good to go with the auto posting with Facebook Auto Poster just need to keep some safe measures so you don't get blocked on Facebook Temporary with group posting. Facebook Auto Poster will be simple and friendly GUI interface which will contain status bar, wait interval and groups section. The group section is simple enough which will include all your extracted groups which you are member of. So you can either select all groups or just manually select specific groups in which you to posts automatically. The status bar is also simple input field where you have to write / paste the status or whatever you want to post in all facebook groups at once. It can include simple text, picture url or website link/ video link, you are good to go with anything you want to post. Just make sure you first check out your post in any of facebook group manually so if it contain anything which is not allowed on facebook so you can remove it from your status and then can publish it to all facebook groups. 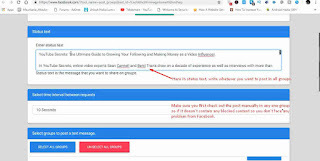 This is just an extra helpful tip I just shared with you guys as I experienced it my self I used to share links like adfly and such other links which was considered spammy links on facebook. So be careful with your post, your account can be blocked temporary from posting in groups if you try to share links (which is not allowed on Facebook) using Facebook Auto Poster. Now the last thing is the safety check of time interval. I recommend to use 10 seconds which is probably the safe time interval so far. It depends on many account activity I my self used 2 seconds and used the poster which posted in 100+ Facebook groups without any blocking error or any other issue, it was safe and working. But I recommend to use 10 seconds so you will never face any problem with group posting on facebook ever. Just make sure you follow my instruction regarding the time interval and safety check of your post manually first in any one facebook group. After that you are safe to use Facebook Auto Poster which will post in multiple Facebook Groups at once automatically. That's all I have for this post I hope this Facebook Auto Poster will help you to post to all facebook groups at once safely. Leave comment if you want to ask something and don't forget to share it with your friends.